As a busy mid 40’s female I have had to work hard to make time for my personal fitness. Over the past 2-3 years I have steadily improved my overall fitness and strength after sustaining a shoulder and lower back injury. This was mostly achieved with simple Pilates and moving through more intense classes such as fitness yoga, PIYO and some HIIT classes. I have also been a casual user of my local gym but never really “got into” weights. When my partner asked what I would like for my birthday, I turned down an advanced driving course(!!) in favour of some PT sessions. 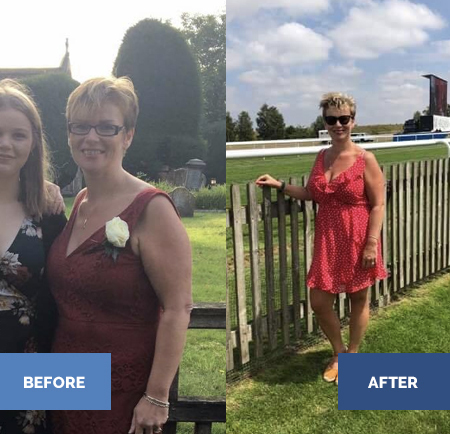 When I met Lucy in March I was ready to learn how I could achieve the best workout for my goals in the time I have available, whilst also balancing “real life” aka that cheeky glass of wine or occasional meal out. I wanted to reduce my overall waist, bust, and upper back measurements – I’m not a big fan of scales. I prefer to see and feel a real change in my measurements, how my clothes fit and how my shape can change. I also wanted to increase my strength without becoming bulky. I have a strong and feminine figure which I wanted to keep but just trim down. What I liked most with my initial consultation with Lucy was that she was very down to earth and listened to my lifestyle choices before offering advice on how I could achieve my goals. I have met fitness individuals before who have gasped at my insistence of having the odd glass (bottle) of wine and told me that I would never achieve my full potential unless I cut booze out completely. As you might imagine they didn’t get the job! Over the last 4 months of training with Lucy I have grown in confidence with the equipment that I am learning to use and have even trained independently in my local gym, adapting my workout with Lucy’s guidance to the equipment available there. I have now seen an overall loss of 20 inches across my body with my highlights being almost 4” from my waist, 3” from my bust and 3” from my hips. I can see a real difference now when I look in the mirror and feel much better in and out of my clothes. I have also lost 7lbs along the way. And all this has been achieved around my lifestyle, I haven’t felt as though I’ve had to slog really hard in the gym or deny myself some nice treats whilst out. I am fairly strict when using myfitness pal for logging my meals and drinks and I do find this really helps keep me accountable for what I’m planning on having to eat and drink. I love my training sessions with Lucy, and I have also recently joined in with some of the 365 family events both social and fitness. We are like a little family, there is an air of internal competitiveness which I enjoy when we have our fitness challenges, but mostly there is a real feeling of support and encouragement within the group. We are a great team! So if you are wondering about joining, don’t hesitate, come along and have a chat with Lucy. You won’t regret it, in fact I’d pretty much guarantee you’ll soon be hooked like me!